Glashütte, Germany based watch brand Tutima is celebrating 85 years since their original founding with a special limited edition timepiece, the Tutima Grand Classic Power Reserve Chronograph. Available exclusively in the US through authorized dealers, each piece comes engraved with a unique year starting at 1927 (their founding year) going up until 2012, for a total of 85 pieces. The Grand Classic Power Reserve comes in a 43 mm by 15.9 mm satin finished stainless steel case with a coin edge bezel and a satin finished 7 link bracelet (which Tutima says is very comfortable on the wrist). 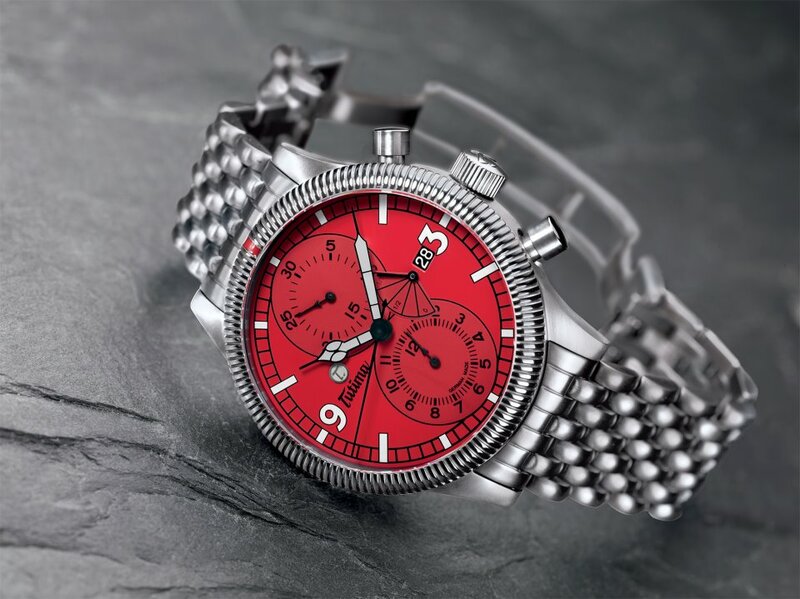 The dial is brilliant red with a contrasting black printed minute track and subdial displays; hours are marked with luminous indices (with the exception of Arabic numerals at 9 and 3 o’clock) Hours and minutes are indicated by luminous Poires style hands. Screw down crown and traditional chronograph push buttons. The dial is slightly domed and features an anti-reflective treatment. A sapphire case back allows a view into the Valjoux 7754 top grade movement, which notably has a power reserve module and Tutima signer rotor. Water-resistance is 100 meters. Functions include hours, minutes, seconds, chronograph, date and power reserve.